Decks are one of the most problematic areas we see in Leesburg home inspections and elsewhere. Here a newel post was simply toenailed into the band board. Other areas of concern are how the band board was attached to the dwelling. Flashing over the band board, open tread risers, spacing between pickets on handrails, lateral bracing, graspable hand rails are also inspected. Support posts are inspected carefully to ensure that they are properly notched to accept the beam. 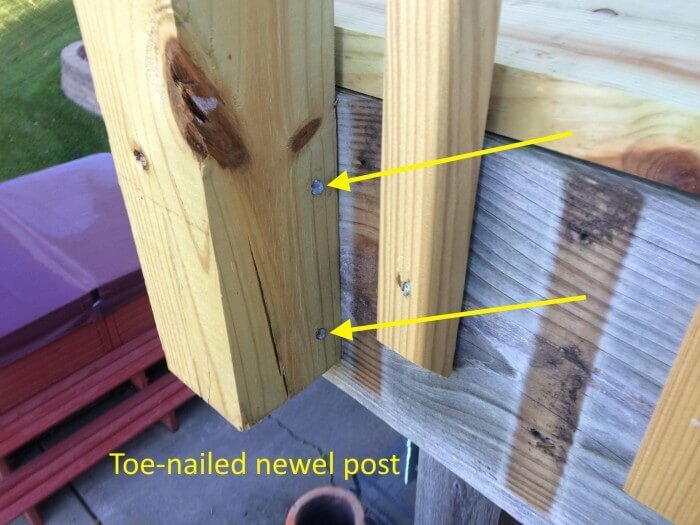 Wooden decks also require maintenance such as tightening bolts and nuts, checking joist hangers for proper attachment, cleaning and sealing to protect against the elements. “Graspable ” handrails are a fairly new addition and a good idea. These prevent children and the elderly from having to grab a 2×6 top cap for stability. Contact Checkmark Home Inspections for deck and home inspections in Leesburg, Virginia and the surrounding area.